See also St. Patrick's Cathedral. The original St. Patrick's Cathedral, located on Mulberry Street between Prince and Houston Streets, was built on land used as the cemetery of St. Peter's Church. On June 8, 1809, the cornerstone was laid, and the completed structure was dedicated six years later, on May 14,1815. Designed by Joseph-François Mangin, the architect also responsible for New York City Hall, the stone structure is over 120 feet long by 80 feet wide with side walls rising to a height of 75 feet. In its early years, St. Patrick's played vital social and political roles in the lives of young Irish immigrants, helping them adapt to their new home. The cathedral was the site of tension between nativist agitators and Irish Catholics. In 1836 a mob attempted to ransack the cathedral, but defenders cut holes in the wall for their muskets and posted sentries outside, successfully discouraging damage to the cathedral. Although the cathedral was then the largest religious structure in the city, Archbishop John J. Hughes envisioned a new and grander cathedral uptown, to serve as a "public architectural monument of the present and prospective greatness of this metropolis." Land for a new cathedral on Fifth Avenue and 50th Street was purchased in 1852 and construction started in 1859. In 1866, the cathedral and organ were partially destroyed by fire. Before the new cathedral could be completed, the original cathedral was restored and rededicated by John Cardinal McClosky in 1868. On May 25, 1879, the original cathedral ceased to be the seat of the Archdiocese of New York and became a parish church known as "St. Patrick's Old Cathedral." In 1966, St. Patrick's Old Cathedral was one of the first sites to be named a landmark by the New York City Landmarks Commission. In 1977, St. Patrick's Old Cathedral and the Old Cathedral School were listed on the National Registry of Historic Landmarks. On March 17, 2010, St. Patrick's Old Cathedral was declared a minor basilica by Pope Benedict XVI. The Chancel organ in St. Patrick's Old Cathedral was built by Hall & Labagh in 1859 for St. George's Chapel, Episcopal, in Newburgh, N.Y. About 1885, it was then moved to the Associate Reformed Church, Newburgh, N.Y., and later (ca. 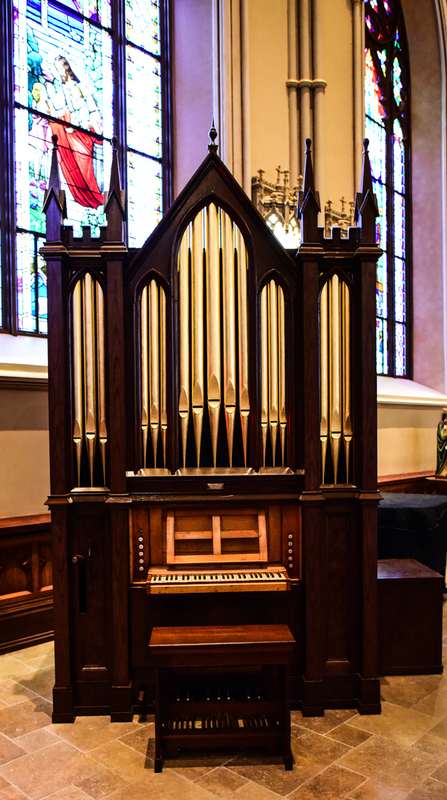 1980) to the Convent of St. Helena, Vail's Gate, N.Y. At some point the organ was put into storage; it was later purchased by the Basilica and restored in 2016 by Brunner & Associates, Lancaster, Pennsylvania. The recessed manual is enclosed behind a locked door. The interior console woodwork is maple. Some of the graining is original on the case, and almost all of the pipes are original (cone tuned). The pitch is A=435, set to a Victorian temperament. The Hautboy stop actually controls a trumpet; this trumpet appears to be of New York origin from the time period of the organ and likely was an early modification. The machine stops were modified early on to not include the reed. It retains the original bench. The organ was originally pumped from the back, then was changed twice; it now pumps from the front. An electric blower was added in the 2016 restoration, and the organ is on a custom metal frame with wheels so it can be moved as necessary. The organ was inaugurated at Mass on October 2, 2016. The organ in St. Patrick's Old Cathedral was built from 1866-68 by Henry Erben of New York City. Erben installed the organ in a Carpenter Gothic-style case that is grained to look like walnut; the keydesk and components are walnut. The console is attached and projecting, with overhanging manuals flanked by round-shanked stop-knobs arranged horizontally in terraced jambs. The performances of these gentlemen fully tested the capabilities of the instrument, and proved that it was excellent in every respect—full in tone, easy in touch and superior to many instruments of similar range. The audience seemed spellbound by the excellent music. Fortunately, little work was ever done on the instrument. Most of the work that was done on the organ was not up to Erben standards: a few of the original ivory stop labels were replaced with cheap plastic; ciphers were fixed with duct tape; and the materials and construction of the replacement mixture were not consistent with Erben's extraordinarily high level of craftsmanship. Neglect has been this organ's friend – not much has been done to it, and it is an exceptional survivor from that age. 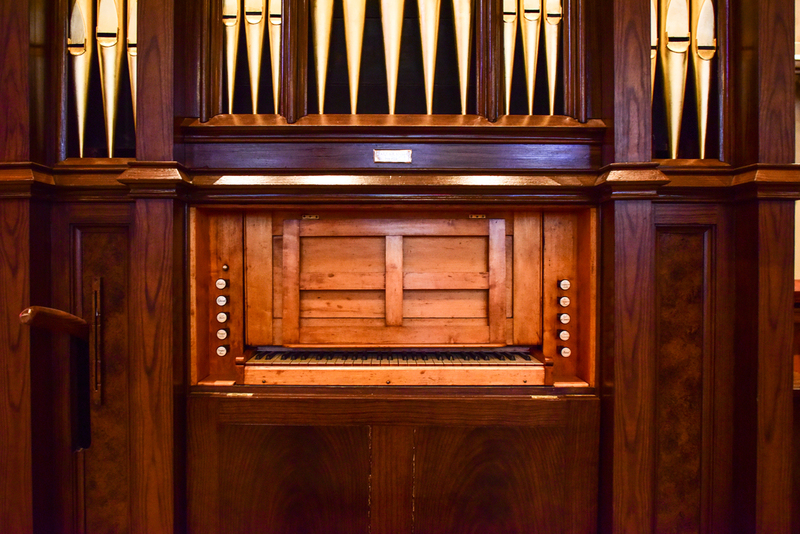 This organ is the only example of an original, extant three-manual Erben, and is a jewel of organbuilding in New York City. On October 24, 2004, The Organ Historical Society awarded its distinguished Historical Citation No. 326 in recognition of the Erben Organ as an outstanding example of organbuilding and worthy of preservation. 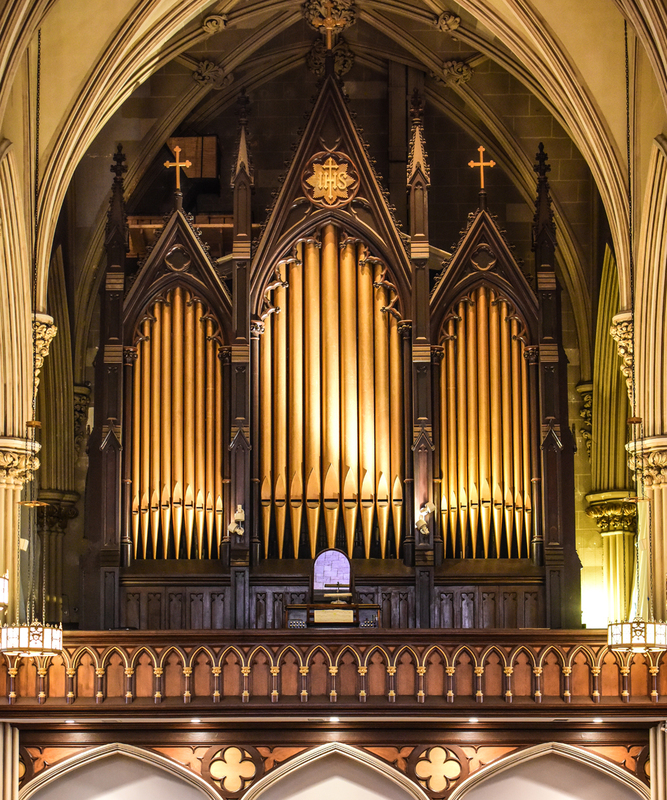 In 1851, Henry Erben was contracted to build a new organ for St. Patrick's Cathedral that had "3 banks keys, 42 stops, 2 octaves pedals." During the afternoon and evening of June 24, 1852, the completed organ was exhibited to the public. Participating at four o'clock were organists David R. Harrison, St. Patrick's Cathedral; Wm. Bergé, St. Xavier Church; John Loretz, St. Stephen's Church; Mr. Mayerhofer, Nativity Church; Mr. O'Connor, St. Bridget's Church; T. Stückler, St. James's Church; T. Augustus Hogan, St. Peter's Church; Wm. R. Bristow, St. Mark's church; and H.C. Griffiths, St. Paul's, London. At eight o'clock that evening, Mr. W. A. King of Grace Church performed works by Kuhlau, Rinck, Mendelssohn ("Wedding March"), and concluded with an "Extemporaneous Fantasie" on various themes to demonstrate the solo stops. Its measurement is 45 feet high, 28 feet wide, and 14 feet deep, and it contains over 2000 pipes. The diapasons are hardly full enough for so large a church, but the reeds and their stops are brilliant. A church as large as St. Patrick's would have borne pedals and diapasons of the largest and most full-voiced capacity; and no number of brilliant stops can possible make up for the deficiency." In 1866, the cathedral interior and organ were destroyed by fire. A new three-manual organ was built in 1824 by Hall & Erben, a partnership of Thomas S. Hall and Henry Erben that existed from 1824-1847. Thomas Hall had married Maria Erben, Henry's sister, in 1824. Specifications of this organ have not yet been located. In 1820, Thomas S. Hall (1794-1874) of New York City altered and enlarged the 1815 Redstone organ. Specifications of this organ have not yet been located. 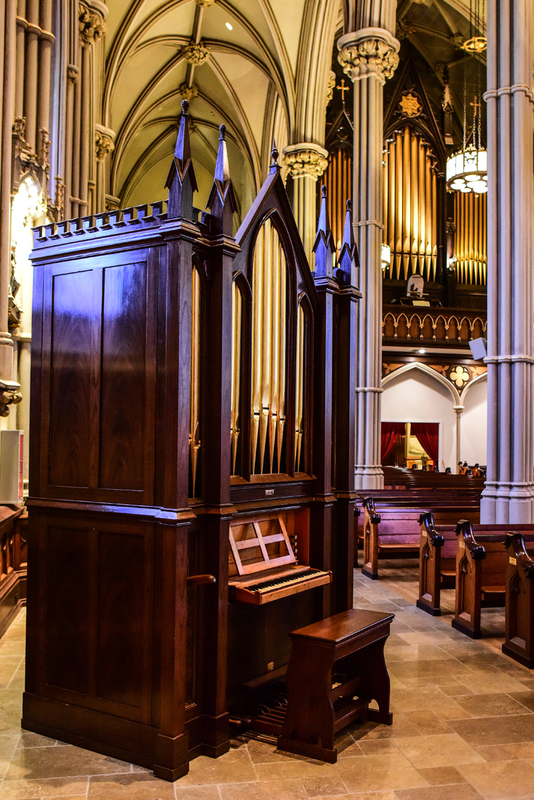 The first known organ for St. Patrick's Cathedral was a one-manual instrument built in 1815 by William Redstone (c.1768-1824) of New York City. Specifications of this organ have not yet been located. American Musical Directory. New York: Thomas Hutchinson, 1861. Lamenzo, Jared. Specification of Hall & Labagh organ. Musical World and New York Musical Times (July 1, 1852). Exhibition of Henry Erben organ. Ogasapian, John. Organ Building in New York City: 1700-1900. Braintree: The Organ Literature Foundation, 1977. Lamenzo, Jared. Henry Erben case; Hall & Labagh case and keydesk. Lawson, Steven E. Exterior; interior; Henry Erben organ.